Discussions are taking place to enable the successful Sheffield Business Park to expand further into Rotherham, with the potential to create 800 jobs. The site of the former Sheffield airport is already home to the likes of Stanley Black & Decker, SIG and ITM Power and is seen as key to the potential Advanced Manufacturing Innovation District (AMID) with the University of Sheffield recently gaining outline planning approval for an advanced manufacturing campus. Phase 2, a joint venture with Peel Land and Property, has the potential to accommodate a further 1.5m sq ft of manufacturing and research and development accommodation. The site is part of the Sheffield City Region Enterprise Zone where financial incentives include a business rate discount worth up to £275,000 per eligible business over a five year period. Part of the site actually crosses the boundary into the Rotherham local authority district and has seen the development of The Car People and the Mercure Sheffield Parkway hotel to the East of the Europa Link. 7.4 hectares (18 acres) in Rotherham is yet to be developed as it was placed in the greenbelt to secure a clear area of land at the end of the former Sheffield City Airport runway. With the airport's closure and development of the Factory 2050 on the runway, plans are now being discussed for the future use of the site and Rotherham Council has it already earmarked for employment use in the latest version of its Local Plan. Planning consultants, Turley, have begun discussions with Rotherham Council and are expected to submit a masterplan that includes four plots, with a range of industrial uses, with the potential for buildings from to 9,500 sq ft to 108,000 sq ft. It is estimated that the space could provide 826 jobs. 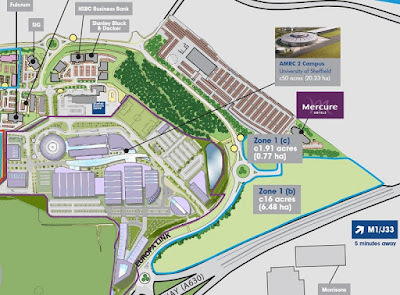 Prominently positioned next to the Parkway, the site would function as a gateway to a hub of sites, including Sheffield Business Park, Factory 2050, the AMRC Campus and the Advanced Manufacturing Park (AMP). The opportunity to meet requirements for another hotel, institutions and ancillary retail could also be included in plans. 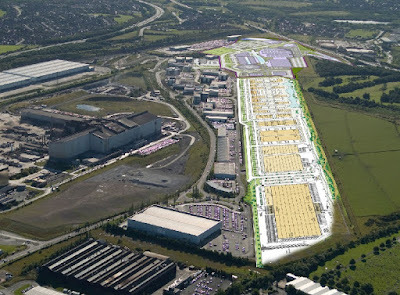 In a letter seeking pre-application advice from Rotherham Council, Matthew Sheppard, director at Turley, said: "It is intended that the development will create a new gateway to the area; integrate the existing advanced manufacturing sites, as well as; adding to the critical mass of advanced manufacturing and supporting facilities in this area as the nucleus to AMID. "The market for advanced manufacturing and R&D is strong, and the Enterprise Zone status of this area offers a clear incentive and competitive advantage to companies looking for new business premises. Requirements for advanced manufacturing have arisen very rapidly over the last year, and the pace of delivery has been equally speedy. It is necessary for plot or building options to be constantly available if the AMID is going to attract businesses which are internationally footloose. "There are three inward investment projects currently interested in Sheffield Business Park, one of which is making locational choices between Sheffield and the Czech Republic. Without suitable sites with permissions in place which can quickly cater for this demand, opportunities will be lost, not just from the Sheffield City Region, but potentially also from the UK. It is for this reason that Sheffield Business Park wish to pursue an application at this stage." One issue is the fact that the HS2 line is proposed to run through this site, with the draft route showing a railway cutting as the line passes under the Europa Link and A630 in a box.